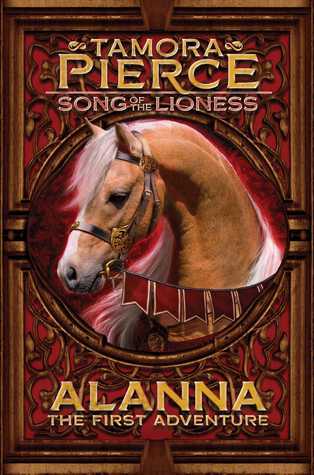 ALANNA: THE FIRST ADVENTURE is the first installment in author Tamora Pierce's Song of the Lioness series. This is a series that was originally released nearly 30 years ago. The book I borrowed from my library was released in 2014. Set in the realm of Tortall, Alanna of Trebold is the main character. Alanna is a girl who wants to become a knight, while her twin brother Thom, wants to become a sorcerer. In this world, girls are sent to a convent called Daughters of the Goddess, while boys are sent to the King's court to learn how to be nobles of the Kingdom. This includes being trained as a page, squire, and later becoming a Knight of the Realm if they pass the grueling tests. When the story starts, Alanna is (8) years away from taking the challenge to become a Knight of the Realm. At the end of this story, Alanna has become a good student, who is fairly proficient with weapons, and can hold her own against almost anyone. Alanna is a wonderful character who is more than what she seems. She is multi-dimensional, which is always a plus in my book. Not only does she face her fair share of bullies, adults with agenda's, Gods who think they are untouchable, and a grueling class load, but she also has to keep her secret of being a girl from being exposed by the wrong people. Unlike Thom, Alanna is afraid of her magic. Alanna was trained in magic by a village healer named Maude. While Thom took it to it like a fish and water, Alanna had to be tricked into trying different spells. Come what may, Alanna's healing abilities is the one thing that gets her noticed by the rest of her friends like Prince Jonathan, and George Cooper, the King of Thieves, as well as a diabolical villain. Did I mention there was a bit of a romantic twist in this story? I have to say I love George Cooper more than I do Jonathan. George is a character who isn't afraid of being who he claims to be, and backs it up in supporting Alanna fully and without hesitation. 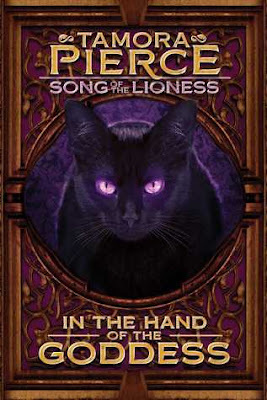 I am happy that I found Song of the Lioness, and that, as of today, I have read the entire series. I encourage girls of all ages to read this series. Pierce is an author who is pro-female characters of all ages. She gives them strength, weaknesses to over come, and someone for girls to cheer on as they battle forces that seem to be stacked up against them. Book # 2's review can be found below. From Tamora Pierce, the second book in the Song of the Lioness Quartet, honored with the Margaret A. Edwards Award. Alanna, disguised as a boy, becomes a squire to none other than the heir to the throne. Prince Jonathan is not only Alanna's liege lord, he is also her best friend - and one of the few who knows the secret of her true identity. But when a vicious sorcerer threatens the prince's life, it will take all of Alanna's skill, strength, and magical power to protect him, even at the risk of surrendering her dreams. IN THE HAND OF THE GODDESS, is the second installment in author Tamora Pierce's Song of the Lioness series. Alanna of Trebold has spent the past several years disguised as a boy training to be the first female warrior maiden in a century. Along to help her, Alanna now has a purple eyed cat named Faithful (he talks), a horse named Midnight, and a powerful sword called Lightning. Alanna is also visited by the Great Mother Goddess who calls Alanna one of her own while giving her a magical necklace. The Great Mother knows that Alanna is still on the path to facing the Ordeal of Knighthood, which is the last step in being named Knight. She also knows that a whole lot rides on Alanna's shoulders. As if that weren't enough, Alanna has become Prince Jonathan's squire. The same Jonathan who now knows her secret after their battle in the Black City. But, she still can't over her fears. Fear of not being accepted once her secret is discovered by the King. Fear of love (choosing between Jonathan and George Cooper who are both brilliant), and the fear that Roger, Duke of Conte, isn't through with his machinations, and his desire to rule Tortall. A subtle message is sent to all girls who read IN THE HAND OF THE GODDESS. You can be both a female and a warrior if you let yourself let go of your fears, and your perceptions that nobody will accept you. Alanna also becomes sexually active in this installment. At her own choosing, not because there is stress in choosing to have it or not. Not overtly mind you, but just enough to let the reader know that Alanna is growing into not only adulthood, but being the woman warrior she chooses to be. IN THE HAND OF THE GODDESS takes Alanna over the final four years before she faces the Ordeal to become a Knight of Tortall. This event not only leads to Alanna's Knighthood, but a death match to the man who she has feared for so long. Curious way to end the story. Not sure if I am set on the romance factor. I do know how it will apparently end and who she will choose, but until then, onward with the show! These are ones I totally wouldn't have looked twice at but I love your reviews for them so I'm definitely interested now. Great reviews and thanks for putting these on my radar! Great reviews. I may have overlooked these too. Thanks for the review. I actually really love those covers. Oh I enjoy when I get into the older series's. :) Glad you enjoyed it! It's the first time I hear about these ones but the series looks good! Wonderful review. This author and series is new to me but it sounds like a good read. Glad to hear that you really enjoyed the series. These sound awesome...I totally would not have expected that from the covers! I love the sound of this book and what Alanna has to go through and the magic here! I've heard that people love this series because of the strong character. Lovely review!